Excellent Credit Recommended (740-850) ? CreditCards.com credit ranges are a variation of FICO® Score 8, one of many types of credit scores lenders may use when considering your credit card application. ? $300 $300 statement credit when you make at least $3,000 in net purchases within 90 days of your account opening. Low variable APR. While there are no ongoing rewards, you'll find a nice little feature in the low regular APR of 11.49%-22.49% variable on purchases and balance transfers, as well as the 0% intro APR on purchases for 7 billing cycles. See more of the best business credit cards of 2019. Get a $300 statement credit when you make at least $3,000 in net purchases within 90 days of your account opening. Save on interest with a competitive purchase APR. 0% Introductory APR on purchases for your first 7 billing cycles. Employee cards at no additional cost to you and with credit limits you set. 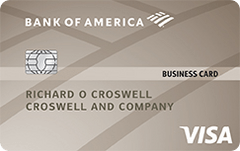 Our take: This bare bones business card offers a relatively low interest rate for cardholders with excellent credit and an appealing sign-up bonus; however, it doesn’t offer a rewards program.